After a whirlwind road trip to Michigan with my oldest to visit my parents, I returned last night and had to make a concerted effort not to plunge neck deep into email. The temptation to see what I would be facing at work this morning nearly got the best of me, but I fought it off and visited with my bride and family, then went to bed. Blogger’s Note: Originally published on the Saint Andrew Catholic Church and School website, July 25, 2018. Last weekend was a whirlwind. 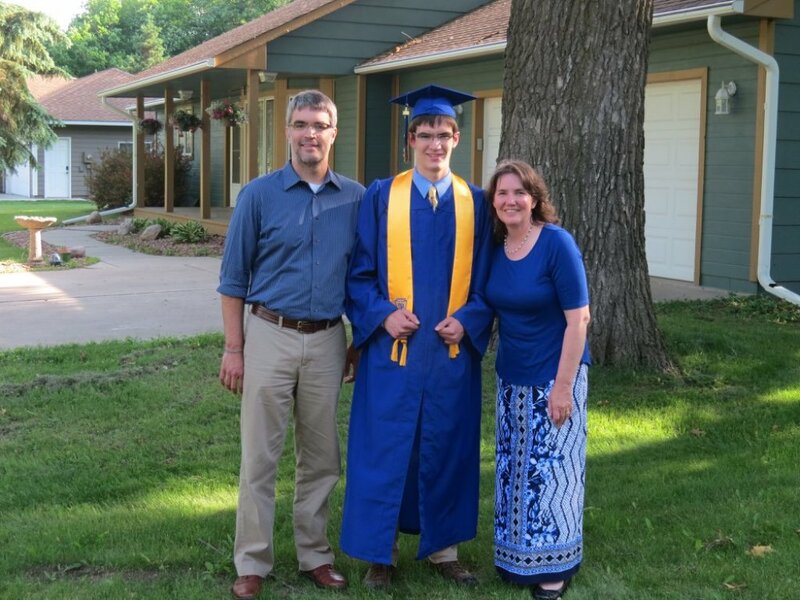 We hosted a graduation party for our second son, Gabe, which meant that my parents, their dog, and my eldest son’s girlfriend, Becky, joined the seven of us and our dog in our three-bedroom house Friday through Sunday. The Engels—six in number, and as much family as our blood relatives—spent much of the daylight hours and a few after dark with us as well. The house was packed to the rafters and filled with laughter; the weather was wonderful, the turnout was great, and a joy was pervasive among almost everyone. Bruno is eight months old today, napping in his crate in a Super 8 outside of Green Bay while Gabe and Trevor read and I write. We spent the past few days at my folks’ place in Michigan, which means Bruno got to spend time with their dog, Maggie, an older, big-boned Oorang type Airedale. Too old to roughhouse too much, but not too old for Bruno to begin to notice something different about her. What’s it like having an eight-week-old male Airdale pup? I’ve said it before; I’ll say it again: like having a preschool boy who’s somehow going through puberty.